Headway UK have launched a free ID card for people who attend Headway groups/ branches. 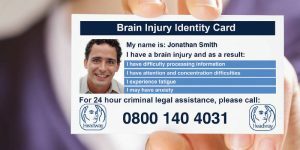 The Headway Brain Injury Identity Card is designed to help police officers and staff more easily identify brain injury survivors and ensure that they receive an appropriate response and support The card can also provide brain injury survivors with added confidence in everyday social scenarios. Click on the link below take you to the page, and give you more information and gives you the option to apply online.